500 of the most important chords used in all genres of music. Learn the building blocks to play songs and create your own music! This unique learning system designed by John McCarthy guides you through 500 of the most important chords used in all genres of music. Each chord is shown with player's perspective view, keyboard diagram and in music notation. Use the downloadable audio demonstrations to hear and play each chord quickly and easily. Learn the chord formulas used to construct each chord so you can create your own inversions and chord scale formulas to put chords together and write your own songs. Download the audio demonstrations and hear every note of each chord played slowly and clearly. Listen to them on your computer or burn them to a CD. As a bonus, you will gain access to the music and backing tracks for 17 of the most common progressions of all time. Use these full band backing tracks to play many of the chords from this book and learn how to apply them to create songs and progressions. You get free lifetime membership to The Rock House Method lesson support system on the web. Use the number found inside this book to register for support at www.RockHouseMethod.com. Use this fully interactive lesson support site along with your product to enhance your learning experience, expand your knowledge, link with instructors and connect you to a community of people around the world who are learning to play music using The Rock House Method. 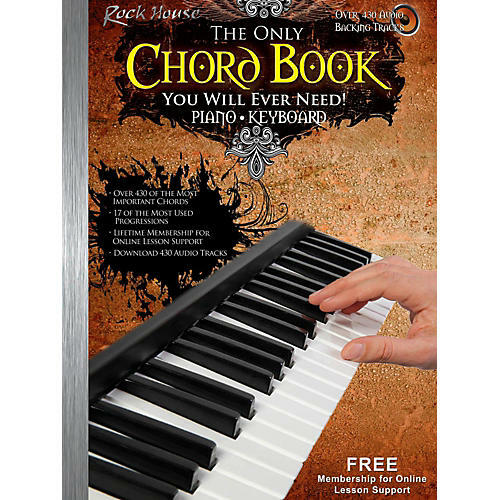 Over 500 of the most important chords used in all genres of music, with professional backing tracks and playing examples. 160 pages. FREE lifetime web membership for 124/7 online lesson support. Knowing a bigger library of chords will make you a better player. Order today.